15/200 Max Braden Better than expected, like a combo of Proof of Life and The Constant Gardener. 33/52 Les Winan Disappointing and mediocre despite top notch talent, beautiful cinematography, and well-done action. 33/159 David Mumpower Dark, depressing tale is oftentimes difficult to watch but engrossing nonetheless. Apartheid might be in Africa’s past, but the racial schism still divides the country’s natives. 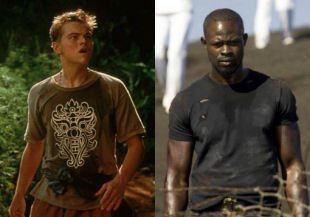 Capitalizing on the fertile storyline potential from such turmoil, The Blood Diamond follows the adventures of Danny Archer (Leonardo DiCaprio). A mercenary by trade, the South African native’s life changes during an unfortunate incarceration. While busted for smuggling, Archer becomes aware of a fisherman named Solomon Vandy (Djimon Hounsou). This gentleman harbors a secret. He has discovered a rare pink diamond whose value is immeasurable. Vandy sees the gem as the key to his becoming the master of his fate once more. He had been taken his from family and forced to slave away mining diamonds for a brutal syndicate. The titular jewel is his leverage to attain financial independence and the personal freedom that would come from it. He also hopes to free his son, who was forcibly drafted into the RUF children’s army. See the latest developments for this project on the The Blood Diamond Movie News page.